Here’s an article from the Rossendale Free Press celebrating our recent award as the 5th highest rated care home in the whole of the North West region of the UK and number 1 rating in the Rossendale/Burnley/Accrington area. You can read the original article here on their website. Staff and residents at Lumb Valley care home, in Rossendale, which has been named as the best home in the North West. 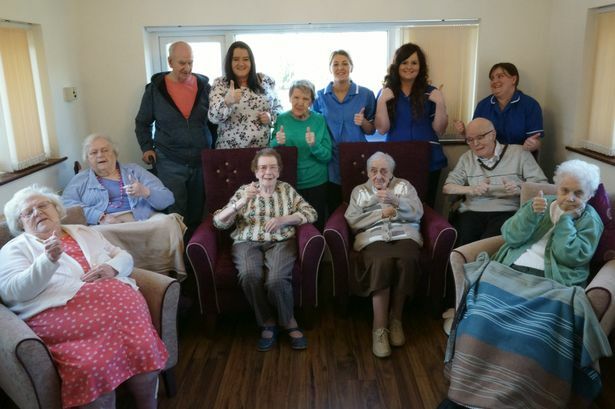 A Valley care home has been being recognised as one of the best in North West England. Lumb Valley Care Home was rated fifth out of 2,043 homes in the region by carehome.co.uk, making it the top recommended home in Rossendale. Davina Ludlow, director of carehome.co.uk, congratulated staff at the home. She said: “We felt the best people to say how good a care home really is, are the residents and their families and friends. “Lumb Valley Care Home has proved that it provides great care and we’d like to congratulate it on being a top recommended home in the North West England. “It’s a fantastic achievement to be recognised for being a highly recommended home from the people you care for. Lumb Valley care home owner, Waqar Hussain, said: “I think this reflects the hard work and true dedication of our staff who work tirelessly on behalf of all our residents and who also have very close ties with them and their families. “We have a great community feel here at Lumb Valley and I believe the great reviews we have received are partly because of this and also because of our staffing policy. He continued: “We absolutely refuse to use agency staff and our existing members of staff have all been with the home for a long time. “That, plus the home’s relatively compact size, means the staff and residents know each other very well indeed.